With heavy hearts we heard the news that the Christian apologist Nabeel Qureshi, a Muslim background believer, passed away on Saturday September 16th 2017 after a year-long battle with stomach cancer. He was just thirty-four years old. Born and raised in the USA, he had devout Pakistani Ahmadiyya Muslim parents. By the age of five he had already read the whole Qur’an and could recite several verses from memory. Nabeel gave his life to Christ following discussions with a fellow college student, a Christian called David Wood. He also spent much time comparing the Bible and the Qur’an. Nabeel was a medical doctor and well-studied in theology and philosophy, academic credentials that earned him respect. He became a world-renowned evangelist through Ravi Zacharias Ministries, writing three books including his best-seller “Seeking Allah finding Jesus,” in which he shares his testimony. He also took part in many debates. He worked not only to introduce Muslims to the Gospel, but to help Christians better understand and love their Muslim neighbours. Nabeel was a brilliant scholar and apologist. To see him at his best, watch his debate on Qur’anic corruption with Bassam Zawadi, and his debate on the nature of God with Shabir Ally. Over the next few years they discussed the foundations of Christianity, the deity of Christ, the Trinity, Jesus’ death and resurrection, the reliability of the Bible and eventually moved on to examining the life of Muhammad, claims about the Qur’an and the history of Islam. These were not casual conversations. They both read books, took notes and met to discuss them. They would watch debates and then talk. David could see Nabeel’s initial struggle increasing: how his conversion would impact his family. Yet he kept moving forward. Nabeel’s attitude slowly changed. It was no longer, “Islam is proven to be true.” It was more like, “We are humans, our mind is fallible. I’ll just keep being a Muslim and if I am wrong I don’t think God will hold me accountable because this stuff is too far beyond us.” David could only pray, “Lord, show him the truth.” Nabeel was praying a similar prayer, “God, I see good evidence for Christianity. Please show me the truth.” He began having dreams telling him to convert to Christianity. Eventually he gave his life to the Lord Jesus Christ and was baptized. Things were very difficult for him in his family for a while. Ravi Zacharias, in his attribute to Nabeel, shared how he noticed that Nabeel was just nibbling at his food while they were eating together a little over a year ago. He asked, “Nabeel, are you not going to eat?” Nabeel replied, “Uncle, I’ve been having some strange sensations in my stomach.” When Ravi heard that this had been going on for a few weeks, he urged him to have it checked out. Nabeel did. This is an announcement that I never expected to make, but God in His infinite and sovereign wisdom has chosen me for this refining, and I pray He will be glorified through my body and my spirit. My family and I have received the news that I have advanced stomach cancer, and the clinical prognosis is quite grim. What purpose could God have in allowing Nabeel to die? With Qureshi’s passing, the modern church has lost a powerful voice. Nabeel’s loss is felt keenly by those who move in apologetics circles. It also raises again the familiar ‘why?’ questions: Why wasn’t Nabeel healed? Why was his life – so full of promise – cut short? These are questions we all wrestle with at some point, and there are no easy answers. I can see that I have much room to grow in my faith, because to me, Nabeel’s death seems such a waste. In my limited, fallen perspective, I see what I imagine could have been. Nabeel could have been miraculously healed; that healing could have caused many Muslims to marvel and convert; he could have had an even more powerful ministry and story; he could have continued writing, speaking, and touching lives. In my weakness, I wonder why these things were not to be; why dying was the path he was set to take; and how death could possibly be for the good of anyone involved. We think we know better than God. Just like the rest of us, Nabeel inhabited a world which groans under the weight of evil and suffering. We don’t know why God didn’t heal Nabeel. We are finite and God is infinite. The good news is that God’s character and power guarantees that He will bring good from evil “to those that love Him and are called according to His purpose” (Rom. 8:28). We don’t know why restoration did not happen in the present, but we have the hope of a God who, through Jesus Christ, will restore Nabeel along with his whole creation. Nabeel, who no longer struggles with cancer, will be raised to new life along with all those who find their life in Christ. “To live is Christ, and to die is gain” (Philippians 1:21). We mourn the loss of Nabeel. But as Paul also reminds us “we grieve, but not as those without hope” (1 Thessalonians 4:13). We may not have all the answers, but we do have hope. Is it because the Muslim God is the true God, and he punished Nabeel for leaving him? Nabeel shared with us that he prayed for healing, lest Muslims interpret his death as a judgement of Allah upon him for converting to Christianity. There may be some who seek to exploit his death in this way. Muslims who suggest this should be asked, “Why did your God wait until Nabeel had written three best-selling books, made hundreds of hours of videos, and helped bring hundreds of Muslims to Christ? 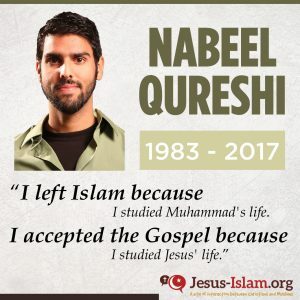 Is his timing off?” Not only that, Nabeel’s work will continue to bring people to Christ, probably in an accelerated manner after his passing. I hope that many Muslims will instead reflect upon the faithfulness unto death of a man who was under tremendous pressure to renounce Christ and return to Islam. Thoughtful Muslims need to ask themselves what sort of radical change in a person’s life could result in such undying faith and commitment. Qureshi was not just an evangelical; he was passionately evangelistic. He desired to cover the globe with the good news that God’s forgiveness was available to all. Apologetic debates, especially with Islamic counterparts, can be an ugly, confrontational affair. But Nabeel took a kind line, targeting the heart, seeing others not as opponents to be defeated, but as people to be loved. This was the message of his final video recorded from his hospital bed, entitled “Love and Peace are our Motivation.” Knowing the end was near, he hoped that his life would be remembered not so much for his intellectual journey, but for the love and compassion he tried to embody. “You know I think it’s very important that we discuss matters of truth. But at the end of the day that is supposed to be undergirded by love and by peace. When we talk to people about our beliefs we should do it through a lens of love and the whole point should be to bring people together. Although cancer took Nabeel’s life, his message of the love of Christ lives on. We each have a cancer called “sin.” We do not like the diagnosis. But it’s a killer. The disease that kills the body is minor. The disease that kills the soul is eternal. The message that Nabeel carried was true. God sent his Son to heal our sin disease. That disease will kill us unless we heed the message of Christ. God in his infinite wisdom has called Nabeel home earlier than expected. It isn’t the first time that godly young men have been taken from this life in their prime. We think of Jim Elliot and his friends, prominent missionaries, slaughtered by the people they were trying to reach with the Gospel, at the age of 29. This is a reminder that our usefulness to God’s Kingdom is no guarantee that we will live a long life. We must redeem the time given to us and make sure that none of it is ever wasted. While Nabeel is now with the Lord, his wife Michele and little daughter Ayah remain with us. As Nabeel asked in one of his final videos, please pray for them as well as for Nabeel’s loving parents. Blessings to you Brother. See you on the other side.